Editor’s note: This is the second of two blogs written by Dr. Shelly Batra, founder and president of Operation ASHA. In part one, she told how she first made contact with India’s “invisible poor” and gradually became disillusioned with her work at a plush corporate hospital. Here, she tells how she founded a health services delivery organization, and is working to make it sustainable and scalable. For more than a decade I had been serving Delhi’s slum dwellers with free surgeries and medical care. But none of what I did was sustainable. The truth is that the word “sustainability” was not in my lexicon. I thought I was doing a great service, not realizing that only a few patients were benefitting. Work was erratic. There was no regular source of income. I was dependant on the charity of well-heeled relations and rich patients to sustain my work. Essentially, I was alone, and there was no hope of going to scale. One day, all this changed. Of the many who had supported my work and then disappeared, sick of being pestered with phone calls and demands for funds, only one remained. This was Sandeep Ahuja, a highly respected senior government official, a pillar of strength who not only donated regularly, he built his own network of regular donors for fundraising so I could focus on operating. In 2005 we founded Operation ASHA with the vision of making a difference. But “making a difference” is just talk. There is nothing specific about it. I had to move beyond rhetoric to action. I decided to focus Operation ASHA on one health problem of India, and that led me to tuberculosis. Polio was being combated with tremendous results by Rotary and, if you see the sheer numbers of those suffering and dying, malaria and HIV were much smaller problems than TB. Besides, many NGOs were already making great progress against HIV and malaria. But TB was the poor man’s disease. There was no awareness about TB, and little or no funds. It was a disease ignored by policymakers and politicians alike. The shocking discovery was that TB was, and still is, the biggest health crisis in India, which bears one-fourth of the world burden. TB – the “child of poverty” as declared by Nobel laureate Bishop Desmond Tutu – disproportionately affects those living in low-income areas with less health care and higher risk factors such as overcrowding, malnutrition, poor ventilation and lack of sanitation. Decades of experience in the medical field reminded me of the stigma associated with TB. Patients suffer in more ways than one. This debilitating disease saps their strength and leaves them unfit for work. They also live in constant fear – fear of dying, of being ostracized, of losing jobs and livelihoods, of transmitting the disease to their loved ones. Above all, an all-pervading fear of someone learning about their illness and hounding them out of their homes and villages. Myths abound even among the educated classes. TB is a curse from the gods. There is no cure and patients are doomed to die. After independence, the government of India launched the WHO-recommended Directly Observed Treatment, Short Course (DOTS) strategy. Under this program, there are more-than-adequate free public hospitals, specialists, diagnostics and medicines available for all. Unfortunately, the government model breaks down in the “last mile.” Patients must visit a designated DOTS center 60 times over six months to swallow their medicine in the presence of a trained provider. The problem is that centers are few and far between and open at inconvenient hours. It takes some patients the better part of the day to get a dose. Challenges were numerous! How would a daily wager earn his living? 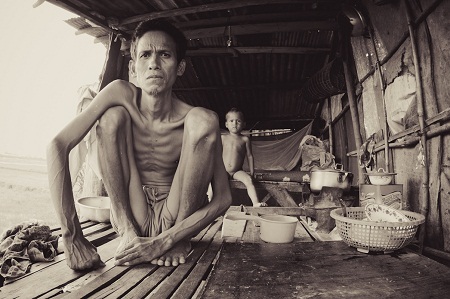 Should the children starve because their father has TB? How can anyone get three days off every week for the sake of the treatment? In an environment where workers are thrown out of jobs because of TB, can anyone afford to declare their diagnosis of TB and need for time off? And there are those who live in absolute poverty, earning less than $1.25 a day. How can they pay the bus fare? The ultimate result is chaos. Too many patients do not step forward for diagnosis and treatment. They continue to suffer and infect others. 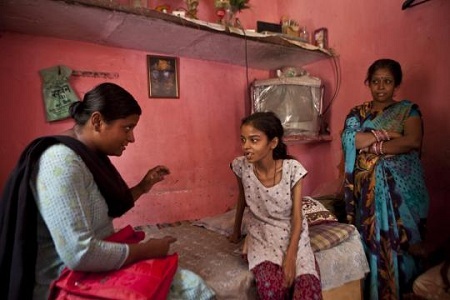 Many who go for treatment stop as soon as they feel better, and the high default rate leads to the dreaded multi-drug resistant TB (MDR-TB), a frightening disease which has 80 percent mortality, where treatment takes two years, medicines are toxic with severe side effects, and the high cost of treatment is a huge drain on scarce resources. Having found the gaps, Sandeep and I worked toward finding low-cost, sustainable solutions. We decided to provide last mile delivery to destigmatize TB, dispel myths, educate patients and communities, find cases and ensure treatment adherence, thus expanding access to government programs. So we partnered with local slum communities to create dense, decentralized DOTS centers in existing convenient locales, such as shops, temples and health clinics, so no patient has to walk more than 10 minutes to receive their medication. Centers are open for long hours. Due to economic reasons, business people in slums work extended hours, which is immensely useful. For example, the first prayer in a temple is at 6 a.m., so children can get their medicine on their way to school. The last prayer is at 9 p.m., so factory workers returning after evening shifts can take their medicine quietly and their privacy is maintained. In rural areas, where patients are scattered, providers travel from village to village on motorcycles, bringing medicines to the doorstep of the patient’s house. In Cambodia, we take the model a step farther. In the Mekong Delta, providers go on boats from island to island to serve patients. Also, right at the beginning, we decided to use local people to do TB treatment. India is a land of diversity. Each slum or village has its own unique character. Often, there are no road or house numbers. We selected local semi-literate residents, aware of local contexts, and gave them quality training, and employed them after they passed a written and verbal test. We gave cash incentives for finding new patients and preventing default. Like with anything, growth incurs costs and the need for more staff. Nevertheless, the progressions brought further opportunities, links and grants which enabled us to sustainably develop our model to serve in other far-reaching countries. Our development was steady and our outreach spread from one center in Delhi to 245 centers across India and Cambodia. Good relationships, impressive and transparent results and proven impact assures growth, support and being accredited worldwide. In 2010, we created eCompliance through a collaboration with Microsoft Research. Since then, eCompliance has transitioned from tracking every dose taken by TB patients to a text-free system for zero-literacy areas, a lab alert system for prompt retrieval of newly diagnosed patients, a tool for contact tracing and improved detection, and much more. Its versatility assures authenticity, transparency and an effective management system tailored to the needs and demands of any country. For TB, eCompliance’s efficacy is exemplified when a person misses their dose. The biometric technology, which has transitioned from netbooks to low-cost Android tablets, also consists of a fingerprint reader. During enrollment patients provide their fingerprint. Thereafter, a patient’s fingerprint is scanned to identify them and ensure no manipulation of data. Missed doses trigger an SMS notification to providers, who take immediate action, as Onno Ruhl, the World Bank’s country director for India, describes in his blog “The Last Mile, at Last?”. This brings default down to less than 3 percent, an unprecedented success, thus “turning the tap off” on MDR-TB. During 2012, we partnered with the Millennium Villages Project and Dr. Yanis Ben Amor (Huffington Post) to incorporate our model into their Ugandan project, where the death rate was 16 percent. We delivered eight hours of virtual training for the use of eCompliance and initiation of our model. The project brought the death rate down to 0 percent, resulting in a successful third-party replication of our model. The project now uses three eCompliance terminals to continue its work. Operation ASHA provides opportunities and encourages growth, empowerment and self-sustainability within communities, servicing the everyday needs of those at the BoP. Our operation provides the seeds of hope, for them to reap and sow, globally. Why all this hard work, you ask? Let us see the writing on the wall. In the next decade, millions of children will be orphaned because of this killer disease. MDR-TB, the new plague, will wipe out millions. In 22 high-burden countries, the estimated loss due to TB will be trillions of dollars. The world simply cannot afford this scale of human suffering and economic loss. It is imperative that we act now. And now, the chilling truth. Today, as I write this blog, approximately 720 people will die of TB in India alone. Dr. Shelly Batra, the founder and president of Operation ASHA, is a gynecologist and obstetrician in New Delhi, India.